Extremely alarming news - there can be NO doubt that next month the muslim floodgates will be open with the hoardes undoubtedly flocking to the benefits-rich UK. This will greatly accelerate the Islamisation of Europe and the UK courtesy of the traitorous EU Dhimmicrats. REUTERS - The European Union said on Monday it would lift visa requirements for travellers from Albania and Bosnia next month, aiming to encourage democratic reforms in the Balkan states, but warned that restrictions could be re-imposed if travel rules are abused. The bloc’s home affairs ministers approved a proposal by the EU executive, the European Commission, to scrap travel restrictions for holders of biometric passports, that have a digitally recorded photo, during a meeting in Brussels. However, they insisted the European Commission would continue to monitor how the two countries comply with EU rules on border controls and passport security, underscoring reluctance in the bloc to open up to unrestricted travel. Some EU governments doubt the two EU membership hopefuls can cope with issues such as illegal immigration and trafficking along drug routes from Asia to Europe, because of weak institutions and alleged corruption. Such concerns increased after a relaxation of visa requirements for citizens of Serbia, Montenegro and Macedonia last year led to a spike in applications for asylum in the EU from the three western Balkan states. “This has ... prompted the European Commission to set up a post-visa monitoring process that aims at preventing risks of misuse and abuse of the asylum procedures,” said the EU’s commissioner for internal affairs, Cecilia Malmstrom. “A visa-free regime also comes with responsibilities,” she said in a statement, commenting on the ministers’ decision. The ministers warned Albania and Bosnia, as well as other Balkan EU hopefuls, that visas could be re-imposed if travel rules are abused. Along with the other Balkan states, Albania and Bosnia hope to join the 27-member European Union, but face years of difficult democratic reforms that have been slow to take off because of ethnic tensions and alleged corruption. In Albania, controversy over 2009 national elections continues to hamper relations between the government and the opposition, resulting in a policy standstill. Bosnia is mired in ethnic strife between Serb, Croat and Muslim parties. EU governments have so far discouraged Bosnia from submitting an official application to join the bloc, saying its democratic reforms are too far behind its regional peers. Albania has applied but is expected to suffer a setback this week, when the European Commission is expected to deny Tirana the status of EU candidate for now. Frequent readers of this blog will know that I am an avid dog lover thus this article from the Guardian merits my passing it along - on a variety of levels. The majority of muslims have a hypocritical association with dogs. They believe dogs are 'unclean' and offensive - refusing to allow even guide dogs in taxis - yet have NO problem making gambling money off dogs as muslims are responsible for 98% of dog fighting rings in the UK. So it's extremely interesting that dogs are now seen as a symbol of rebellion in Iran. Dogs are indeed man's best friend. Recently a visitor from Iran assured me that her dog was staying at a five-star spa in Tehran for the duration of her trip. I had no idea she had a dog in the first place, but was struck that she had insisted in telling me such a thing. Over the past few years, dog ownership has become yet another unlikely arena for the social and political dispute within the tumultuous politics of Iran. It is well known that dogs, along with pigs, are considered unclean in Islam. Strictly speaking, the theology doesn't ban their ownership, or petting; the Sunna prescribes that dogs are "pollutants", contact with them rendering believers ritually unclean. This means that ritual cleansing is required before one is able to perform prayers. Despite this, dogs have been kept by Muslims for centuries. For example, salukis, an ancient breed of hunting dog, have historically been valued by the Bedouin, who breed them for both their beauty and their prowess in hunting. However, having domesticated animals free to roam inside a house, contact with which would require ritual cleansing, would be quite tricky from a practical point of view for Muslims who are required to pray five times a day – even though there is no actual legal prohibition of dog ownership. The Islamic Republic of Iran makes not only the application of the laws of Islam its constitutional duty, but also the promotion of godly behaviour its social remit. It has an Orwellian state ministry tasked with the promotion of "better behaviour" according to Islamic mores. This is the sharpest point at which the ideological state comes into contact with a people, who are at least as fun loving as they are God fearing. Even though a Saudi-style morality police has no place in a much more modernised, sophisticated and complex country such as Iran, nevertheless, official and semi-official state agents conduct waves of enforcement against manifestations of un-Islamic social conduct. Laxed hijabs of young women are a primary target – such clampdowns are conducted in well-anticipated cycles, once or twice a year. Being a pragmatic state with already strained resources, the Iranian government announces such clampdowns well in advance in order to reduce the number of confrontations. Street patrols stop, admonish and occasionally fine or arrest the offenders. The very fact of the announcement makes it clear the ritualistic nature of such campaigns. The state prohibition of anything in Iran is an open invitation for its widespread social promotion. Blond hair and garish makeup, nose jobs (of which Iran is the world capital) and extravagantly sculpted and gelled hairstyles for boys are all forms of sedition – political statements with a small "p". The state's legitimacy is thus questioned and openly ridiculed, at least by a certain section of the population. As it happens, opponents of the state and its ideology also have the means and the spare time to indulge in such practices because they are, by and large, members of the affluent urban elite. But the religiously informed state disapproval of dogs in Iran has a deeper resonance than a garish pair of Dolce & Gabbana crystal-studded sunglasses. Before the Muslim invasion and conversion, Iran's state religion was Zoroastrianism. In ancient Iran, dogs were particularly treasured and well-treated animals. The Gathas were explicit in the promotion of dogs as good and godly creatures; furthermore, the Zoroastrians believed that the bridge to the afterlife was guarded by dogs, so being nice to dogs in this world might have its reward in the hereafter. After the Islamic conquest and the gradual but eventual mass conversion of Iranians from their national religion, disdain for dogs was not only a way for the conquerors of humiliating nation but a way for the new converts to prove their devotion to their new religion. Cruelty to and avoidance of dogs was the equivalent of the dried ham for the reconquistadors in Spain, where the newly converted Jews and Moslems were forced to keep pigs and to eat them to confirm the earnestness of their conversion. The past 1,400 years or so haven't been that much fun for dogs in Iran. All that has come to change paradoxically through the very same religion responsible for their plight. Their recent popularity and adulation must have taken Iranian dogs by surprise. Dogs are now as much symbols of safe, middle-class resistance as false eyelashes and green wristbands. Pooches have never had it so good, and rare breeds, especially small lap dogs, change hand for tens, sometimes hundreds of thousands of dollars. An underground industry of dog beauty parlours thrives, mostly run out of private homes, as do a plethora of canine protection and welfare charities. A legal and substantial kennel industry has developed into what is fancily called "dog spas" where the middle class deposit their dogs when on holiday or, in the case of some of my conflicted relatives, when a devout auntie comes to stay. The industry booms further every time a firebrand preacher calls for their banning or admonishes dog owners from such platforms like the much loathed national radio and TV. Its been a long time coming, but Iranian dogs are having their day. I've always believed one of the most 'telling' characteristics regarding muslims is their hypocritical relationship with dogs - muslims believe dogs are unclean - even guide and other service dogs - yet - 98% of the [despicable] dog-fighting rings in the UK are headed by muslim men. As I've proclaimed in the past - I am a BIG dog lover so I can't pass up a good dog(s) story. My current best mates are two English bull terriers, but I have owned German Shepherd (Alsatian) dogs & English Setter dogs in the past. Each breed unique in intelligence, personality and traits. Whether a 'purebred' or mongrel - dogs have been responsible for super-heroic feats throughout history........ thus we have 'The Magnificent Seven' of WWII fame shown below. Where would we be without our dogs? 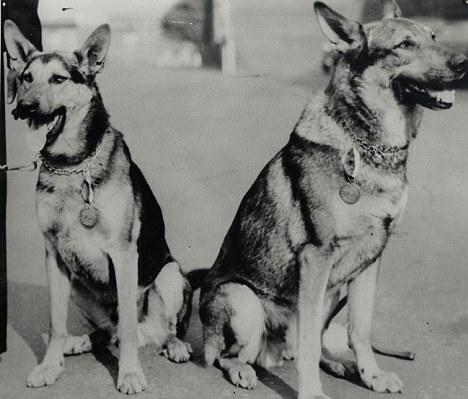 In the canine world they are the Magnificent Seven – the dogs that helped us survive the Blitz. As the bombs fell on London they scoured the rubble of ruined buildings, finding hundreds of survivors for rescue teams. When the Second World War ended, each was awarded the Dickin Medal for uncommon valour, the four-legged equivalent of a Victoria Cross and the highest honour bestowed by the charity the People’s Dispensary for Sick Animals. 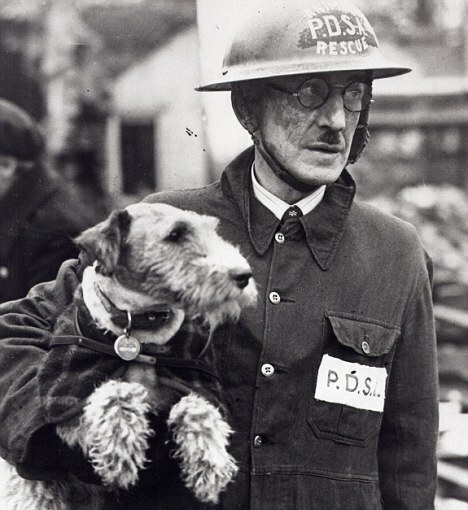 Now, in the 70th anniversary year of the Blitz, all seven are to be remembered in a PDSA roll of honour. His owners signed him over to the War Office in the hope he might help on the Home Front. He passed search-dog training with distinction and went on to locate a succession of victims trapped in or under bombed buildings. His most triumphant moment came when he saved the life of a small boy in Chelsea after one of the last flying bomb attacks on London. Recognition came when the Civil Defence was formally stood down at a parade in Hyde Park. 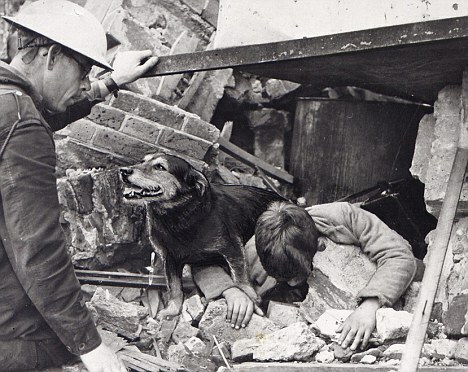 A stray adopted by an air raid warden unit after being bombed out of his London dockland home. They couldn’t stop him becoming a search and rescue dog – it seemed he did it for the enjoyment. In 12 months between 1940 and 1941, he rescued more than 100 people from the air-raid ruins. He carried on the good work for another four years. 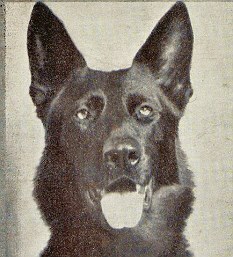 Jet of Lada, to give him his full pedigree, was born in Liverpool to celebrated breeder Mrs Babcock Cleaver. He attended ‘war dog’ school in Gloucester from the age of nine months and was initially stationed in Northern Ireland, later distinguishing himself in anti-sabotage work for the Government. When he was rebased in London, he became one of the most successful rescue dogs of the war, called out every night until the end of the air attacks on the capital. Pioneered a special squad to locate and rescue trapped animals despite never being trained for a wartime role. Her owner Bill Barnett, a PDSA superintendent, used to take her on patrol with him when he toured the East End with a Civil Defence unit. She rescued 63 animals overall. Irma trained at the Ministry of Aircraft Production Dog School and is credited with saving hundreds of lives. Her ability to locate victims through the most dense and difficult obstacles constantly astounded her handlers. After one air raid she insisted she had found life under a collapsed house, and refused to budge. After a day, rescuers pulled two young girls alive from the ruins. 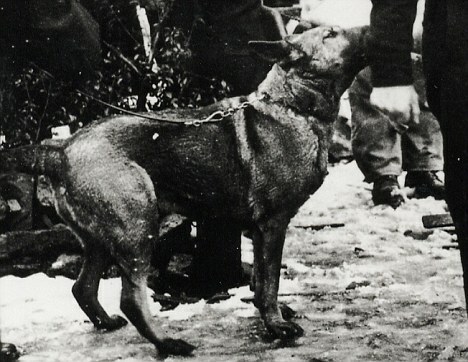 Thorn came from a distinguished line of search and rescue dogs. He was spectacularly fearless and happy to dash into blazing buildings to do his sniffer duty inside. He once found a family trapped under a burning house. How he detected their scent baffled rescuers – but they got the family out alive. Rex was described by Civil Defence authorities as having done ‘outstanding good work’ during the years he worked to the end of the war in 1945. They said he ‘displayed uncanny intelligence and outstanding determination in his efforts to follow up any scent which led him to a trapped casualty’. The British judicial system is bursting with Christian haters. "Do we have to wait until the hate-filled mobs storm into Canterbury Cathedral and drag him from the pulpit before the Archbishop of Canterbury grasps that Christianity is in danger in this country? Nice, furry, mild and useless, Dr Rowan Williams chose this Easter week not to protect his Church, but to rebuke several bishops who had rightly warned of the swelling rage against the Church." "Does anyone really believe that she (Shirley Chaplin) would have been pestered by authority if she had worn a Muslim symbol on a chain round her neck? Does anyone believe that a Muslim preacher would have been put in the cells, and fined �1,000 - as happened to Shawn Holes in Glasgow - for callinghomosexuality a sin in a public place? Each of these cases lets others know that they had better be careful, and makes many faithful Christians fear that they may have to choose between their faith and their livelihood. " That IS the choice currently offered up - isn't it? Shirley Chaplin has worn a crucifix since the age of 16. And except for the time it was removed for a few hours when she had an operation, she has never taken it off in 38 years. It is the core symbol of her faith and a treasured constant. It has helped comfort others and has frequently given succour to the 54-year-old nurse in her own moments of need. There was the time when, petrified of flying, she gripped it while visibly shaking in her seat during her first trip on an aircraft. 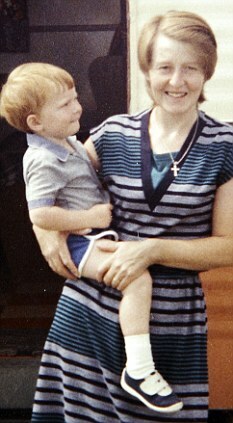 She clung to it again when she gave birth, praying that ‘if I had a handicapped child God would help me handle it’. And she drew solace from it when her mother was rushed to hospital after a car accident. In an age of dwindling congregations, when women increasingly wear religious symbols as fashion accessories, Mrs Chaplin’s inch-long crucifix and chain is an essential part of her very being. So the notion of taking it off, much less losing it, is unthinkable and leaves her feeling horribly dislocated. Worse still, being forced to take it off, ‘would violate my faith’. That, though, is precisely what did happen to Mrs Chaplin, a ward sister who has devoted her life to her patients. Or at least that is what the bosses at the Royal Devon and Exeter Hospital tried to do. They told her to hide or remove it because they classed it as jewellery, rather than an essential manifestation of her beliefs. She refused. Last week, her claim that she has faced discrimination made headlines when it reached an employment tribunal in Exeter. The tribunal’s judgment is expected on Tuesday. Although the crucifix appears benign enough, the hospital Trust insisted it breached health and safety rules because it could, theoretically, scratch patients. Mrs Chaplin finds this frankly preposterous and instead sees herself as the victim of a politically correct persecution, her sense of injustice heightened by the knowledge that other hospital staff have been allowed to carry on wearing the Muslim hijab or headscarf. ‘I feel personally discriminated against, and I am very angry,’ she said in the first full interview she has given since her ordeal began. 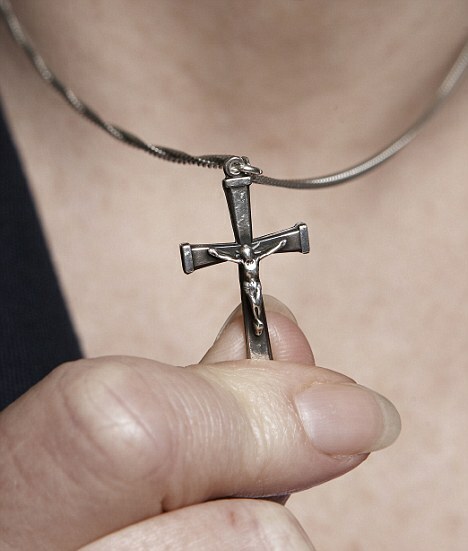 ‘I have worn my cross for 38 years and it has never harmed anybody. If I am forced to hide it, I feel I am denying my Christian convictions. I feel torn between my two vocations – my faith and my job. ‘I have respect for Islam as a faith and I admire Muslims for sticking to their views, but they do not seem to face the same rigorous application of NHS rules. Not only are they allowed to wear headscarves in the wards but other, non-religious staff wear jewellery and have not been challenged. It is easy to sympathise with Mrs Chaplin, to feel angry on her behalf – as many have. But might it also be natural that some will view her as an uncompromising religious zealot, someone who quietly relishes the commotion her case has caused – at the very least, someone who is perhaps just a little bit odd? She assumes that some people will indeed think such things. But none of them resemble the truth. Brought up in the Church of England, she speaks about her religion only if she is asked about it. Her cross and chain was a present from her family to mark her confirmation service at St Mary’s, her parents’ parish church in Bishops Lydeard, near Taunton, Somerset. Beyond the crucifix in question, her neat bungalow, set in scrupulously-tended gardens overlooking rolling Devon countryside, is devoid of any religious symbols and icons. Instead it is adorned with photographs of her two grown-up sons and three young grandchildren, as well as books on antiques and coins, her husband Paul’s hobby. He is a retired ambulance driver, who first met Shirley at a hospital party in 1980, and without whom she would have collapsed in an emotional heap. He was struck then, as countless future patients would be too, by her calm and thoughtful manner and brilliant smile. At 5ft 2in, her slight figure and neat, auburn hair make it easy to imagine her as a nun, though it’s a calling she has never considered. Over mugs of strong tea, she tells of the Christian values that have shaped her life: helping others, honesty, love for her family. After leaving school in Taunton, she dabbled in jobs as an accounts clerk and selling TVs before enrolling as a nursing assistant at a special needs school. From the first day there, she knew she wanted to care for people. In 1976, she became au pair to a family in Copenhagen and spent 15 months there before returning to begin nursing training in Exeter and a love affair with Paul. Their family life was singularly normal: school runs, weekend walks, gardening, dinner with friends. Summer holidays were often spent on the unspoiled beaches of the Gower Peninsula in South Wales – Mrs Chaplin’s fear of flying ruled out foreign trips. Until that first flight. Several times during the interview she apologises for not being able to articulate the depth of what her crucifix means to her. ‘I can never find the right words to describe it,’ she says. ‘It’s like it’s always there, for big and small problems alike. ‘I know that I do often hold it and fiddle with it. When I was preparing my case, I had to show that the cross wasn’t some kind of whim – that I’d always worn it on the wards. That it is a source of tangible strength to her is beyond doubt; both the miniature Christ figure’s face and loincloth are worn smooth from nearly four decades of touching. Some of the ‘evidence’ used to undermine her case clearly still rankles. The claim by senior staff that they saw her on the wards without her cross she finds upsetting and baffling. ‘Do they really think I would lie about that?’ she says. ‘The whole point about my cross is that it’s visible. Of course, it may slip below my neckline if I’m busy with patients. I’m not always going to be checking. I never realised certain people on the wards were observing me so closely. I have no doubt that the Trust has taken an anti-Christian position and wants to defend it, come what may. Mrs Chaplin is adamant that most patients are reassured by the sight of her crucifix. ‘People are not sure who to trust and a Christian nurse prepared to publicly show her faith says a lot,’ she says. 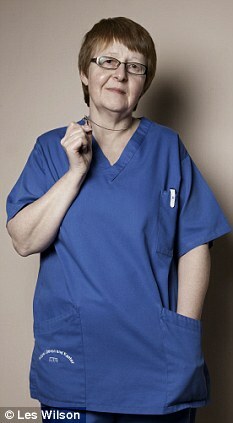 Her relationship with senior matron Julie Vale, her NHS nemesis, has been defined by their battle over the cross. But there were never any shouting matches, nor table-thumping, despite the ‘emotional pressure’ she felt to remove it. Mrs Vale, who joined the Trust in 2008, first confronted Mrs Chaplin about her cross in June last year. ‘I was completely taken aback,’ she says. ‘I looked at other members of staff wearing jewellery – they hadn’t been challenged.’ After three further verbal warnings from Mrs Vale, Mrs Chaplin was approached by another senior matron, Alison Wootton, as she worked at a nurses’ station. She was ordered once again to take off her cross and when she refused, explaining that she felt it was an essential sign of her faith, she was handed a letter summoning her to a hearing with Mrs Vale two weeks later. That meeting took place in a cramped office across a table. There was no offer of coffee and the small talk was limited. ‘It was very intimidating,’ says Mrs Chaplin. ‘If you were called in to see the matron, you knew something was seriously wrong. Up until then, I had been verbally warned, but suddenly I was in a more formal meeting where I feared I could lose my job. ‘I was really distressed and I felt I was being bullied. I couldn’t give a coherent explanation of my faith and I was in tears by the end. ‘The main issue seemed to be whether or not my cross was visible. I tried to reinforce how strongly I felt and said something like: ‘Why don’t you just put me in a cupboard somewhere’. ‘I felt I’d done a highly professional job and in 30 years no one had ever grabbed me or had their arms scratched. Mrs Chaplin and her supporters believe the impasse could have been resolved with a little common sense. Instead, at a time when the NHS faced unprecedented pressure for savings and efficiencies, she was repeatedly hauled before senior executives at the hospital to hear why her cross and chain could not be tolerated. In total, she attended ten formal meetings convened either by Mrs Vale or her hospital Trust’s senior human resources manager Adrian Tyrrell After the first, Mrs Chaplin received a written warning from Julie Vale threatening disciplinary action. She was now suffering from the typical symptoms of stress – breaking down in tears, sleepless nights – and her doctor ordered her off work for two weeks. She returned in early August to be told again by managers that disciplinary action was looming. 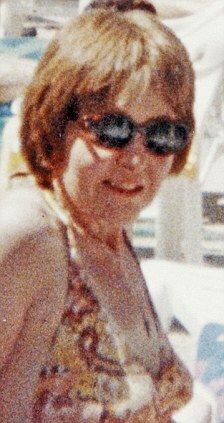 Again distressed, she was sent home on special leave, returning nine days later. 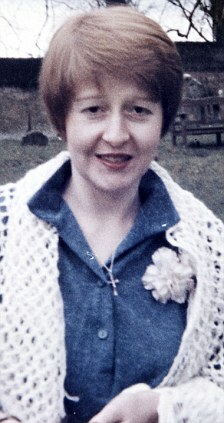 Further meetings followed in August and in September, at which she was accompanied first by a Royal College of Nursing representative – who told her the union could not support her case as it had agreed the uniform policy – and later by the vicar from her Free Church of England church in Exeter, the Rev John Eustice. At one point, Mrs Chaplin asked whether she could pin her cross to her uniform to test whether it was the cross or chain which was the problem. ‘I believed there was discrimination against me as a Christian per se, so I specifically sought clarification of whether they wanted to remove Christian symbols from sight,’ she says. Her bosses argued that the chain in particular was a health and safety risk because confused or violent patients could grab and yank it, potentially throttling her or injuring themselves. Mr Eustice scoured jewellery shops in the city for a solution and found a chain with a magnetic clasp which separated under the slightest pressure. But while this may have solved the grabbing issue, managers then argued the cross and chain could scratch and possibly infect vulner-able patients if Mrs Chaplin was engaged in close-up clinical care. She was told that even if the chain had a magnetic clasp she would have to wear it beneath a high-necked T-shirt, something she felt amounted to ‘hiding my faith’. Her managers also argued that the cross was not a mandatory requirement of the Christian faith and therefore she was not eligible – under policy 5.1.11 – for an exemption from the hospital’s uniform policy. When Mrs Chaplin complained that two female Muslim doctors were allowed to wear their hijabs, she was told this had been agreed within the uniform policy. She says: ‘Muslim staff are allowed to wear a hijab, but this raises more profound health and safety issues than a crucifix, both in the danger to the individual grabbing the material and in the cloth harbouring infection. ‘To my mind, it seems everything’s OK but the cross. I think there is a lot of hostility to Christianity behind what the Trust has done. ‘The Trust said that the two Muslim doctors had compromised on their faith by agreeing to keep their arms bare in clinical situations. ‘I just wonder what they would have done if those doctors had insisted on covering their arms. ‘I was also told that the headscarf was seen as a mandatory requirement of the Muslim culture and therefore could be exempted. At some of the meetings, the Trust tried to offer what it regarded as solutions. One of these involved clip-on ear-rings with a cross symbol. Mrs Chaplin rejected this because she felt it was disrespectful. She also shuddered at the prospect of accidentally losing an earring in a patient’s bed, creating the risk of bed sores and infection. Other ‘compromises’ were mooted, such as wrapping the cross and chain around her lanyard or ID card and keeping it beneath her uniform or tucked down by her side. Neither met her determination to wear a clearly visible symbol of her faith. She adds: ‘Every decision they make seems inconsistent. For example, they allow staff medi-alerts, which warn of various health conditions, to be visibly hung round the neck on a chain. 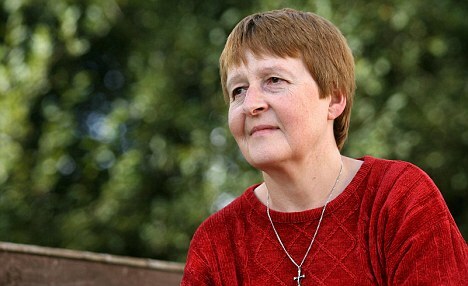 She added: ‘It’s now so difficult to stand up and be a Christian. It is almost becoming an underground religion because people are so frightened to display their faith. The whole landscape seems to have shifted over the past few years. ‘I’m amazed at the situation I’m in after 30 years of nursing. It’s as though, suddenly, it doesn’t count. Nothing I have done has changed. I’ve worn my cross all that time. ‘The idea that necklaces are banned in practice is just ridiculous. Staff wear them all the time, though perhaps not at the moment while my case is high-profile. The policy is being enforced much more vigorously than it has in the past. ‘Besides, as I keep trying to explain to the Trust, my cross isn’t a necklace. It’s a personal manifestation of faith. I don’t particularly like jewellery. I don’t even wear make-up. Eventually, in September, Mrs Chaplin was again summoned and realised that if she did not accept re-deployment to a non-clinical role she would be sacked. She accepted under protest. Further meetings were held in October and January 2010. By the second of these, she had started work as an admissions/discharge co-ordinator but was still fighting to get her old job back. 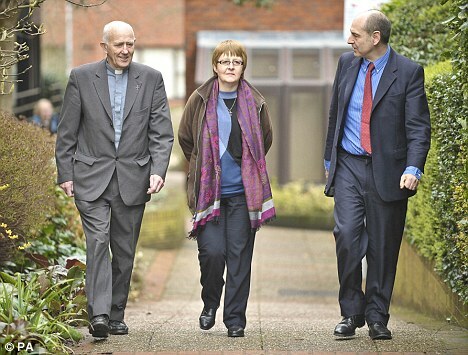 With the support of the Christian Legal Centre, and represented by the leading human rights lawyer Paul Diamond, she launched her employment tribunal case, with the backing of former Archbishop of Canterbury Lord Carey and a handful of other bishops, – though not the current Archbishop of Canterbury, who criticised the bishops supporting her. On the opening day of the case last Monday, the Trust’s human resources director Lynn Lane said in a statement: ‘We are very disappointed that this matter could not have been resolved before now. Mrs Chaplin says: ‘In an ideal world I’d like the tribunal to say I can go back on to my ward, wearing my cross and caring for my patients as I have always done. ‘If I lose, then it will be a sad day for all Christians and freedom generally. I feel so frustrated that it has come to this, when there is so much else the NHS needs to address, such as the problems with failing Trusts. ‘I know my Church congregation is praying for me and the countless emails I get from Christians around the world give me the strength to see this through. ‘So this Easter Sunday I’ll be giving thanks for all that support and praying for Christians who face the same reaction to the manifestation of their faith as I have. As she has for 38 years, she touches the crucifix – in search of strength and hope. And on this weekend, especially, prays they will not be denied. He spent five years patrolling alongside British troops in Afghanistan, surviving gun battles and explosions. Tangye the labrador was bought from a local family as a puppy before being adopted by C Company, 3rd Battalion The Rifles, and becoming a popular companion for the soldiers, who called him 'fearless under fire'. Now he is starting a new life in Britain after an astonishing public campaign to save him from the dangers of the frontline. There had been concerns that he could be killed by a landmine or even targeted by Taliban snipers in an effort to lower British morale. In January, a Facebook campaign was set up by Labrador Links Rescue, an online forum run by Natalie Pomroy, 39, from Essex. 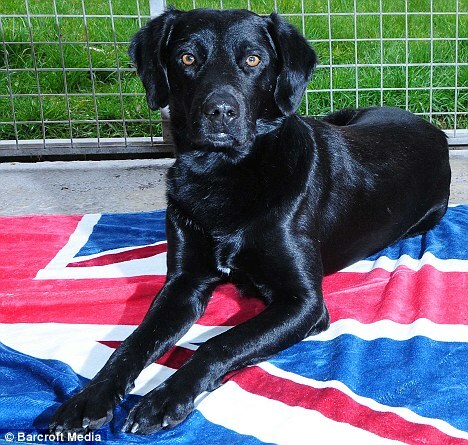 The campaign quickly attracted more than 5,000 members and, with the help of a charity called Labrador Retriever Rescue Southern England and volunteers, raised the £5,000 needed to pay for the dog's safe passage to Britain. 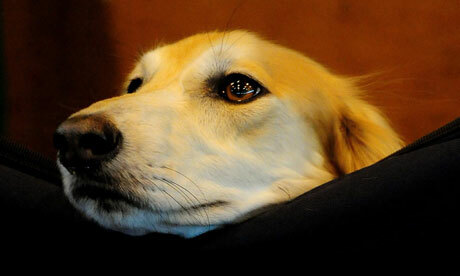 LRRSE then teamed up with British charity Nowzad Dogs, which rescues war-afflicted animals in Iraq and Afghanistan. Nowzad looked after Tangye in Afghanistan and arranged his transport once the funds were raised. LRRSE will now take care of him in the UK. Such was Tangye's popularity that he became a mascot and source of morale for the men of C Company. But Jean Henman of LRRSE said: 'He would run ahead of them on patrols and they were getting worried he'd step on an improvised explosive device. Tangye, who was named after a village near forward operating base Zeebrugge at Kajaki in Helmand Province, where he lived, left Kajaki by boat before being flown to Britain on Wednesday and transported to quarantine kennels. He will spend six months there and if given the all-clear will then be found adoptive owners. As most of my readers know I am a BIG dog lover - my two English Bull Terriers are my two best mates. I have been outraged at any stories of the mistreatment of dogs particularly in the use of dogs for fighting --- of which 98% of dogfighting in Britain is lead by muslims. I am also very concerned that the USA military is sending hundreds of trained bomb sniffing dogs to Iraq. It is well know that muslims view dogs as filthy animals -even if the dogs are being used to insure safety - so the US military needs to make absolutely sure that the continued care and well being of these dogs is tantamount. 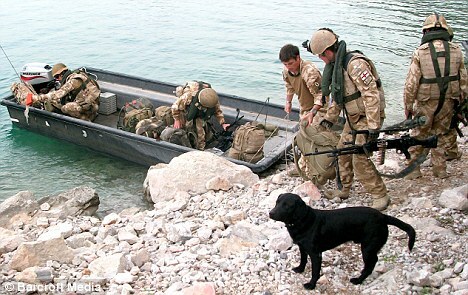 On a positive note -- whilst Islam invades the lives of non-muslims from the cradle to the grave - that hasn't stopped many of Man's Best Friends from being a heroes - and fortunately it hasn't yet stopped Great Britain from recognizing one very heroic military dog. Will it always be so? An Army search dog that has saved the lives of scores of British soldiers in Afghanistan is to receive the canine equivalent of the Victoria Cross. Treo, an eight-year-old black labrador, has spent the past five years sniffing out bombs and weapons hidden by the Taliban. Yet as a puppy he was a badly behaved rebel in danger of being put down until intensive Army training turned him into the gutsy canine described by his handler, Sergeant Dave Heyhoe, as the best military dog he has served alongside. Now Treo is to be honoured with the Dickin Medal from the People’s Dispensary for Sick Animals for his conspicuous gallantry and devotion to duty. It will be placed around his neck this month by the charity’s patron, Princess Alexandra. 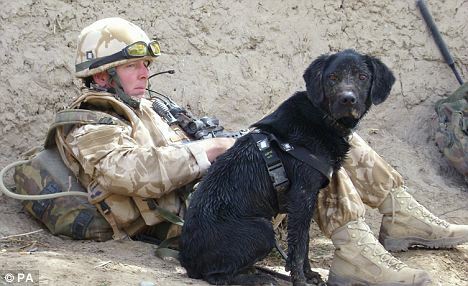 Treo’s heroics include finding a ‘daisy chain’ improvised explosive device (IED) while working as a forward detection dog in Sangin, Helmand Province, in March 2008. A daisy chain is two or more bombs wired together and concealed by the Taliban on the side of a path to maximise casualties among soldiers on patrol. In September 2008, Treo saved another platoon from guaranteed casualties when he again found a daisy chain. According to the Army, his actions have also saved other soldiers and civilians from death or serious injury. Both Prince Charles and Gordon Brown have been introduced to the labrador on his return to Britain from his many six-month tours of duty. Treo is attached to 104 Military Working Dog Support Unit, Royal Army Veterinary Corps. 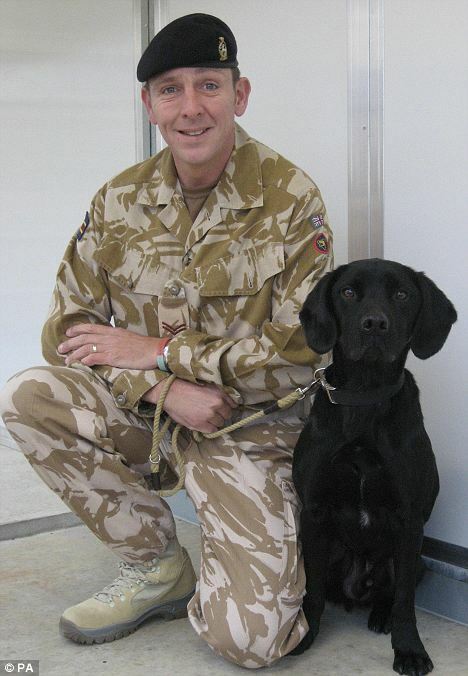 Sgt Heyhoe, 39, who will accompany Treo to the award ceremony at the Imperial War Museum in London, described Treo as his ‘mate and best canine friend’. PDSA director general Jan McLoughlin said last night: ‘We look forward to honouring Treo with the Dickin Medal. 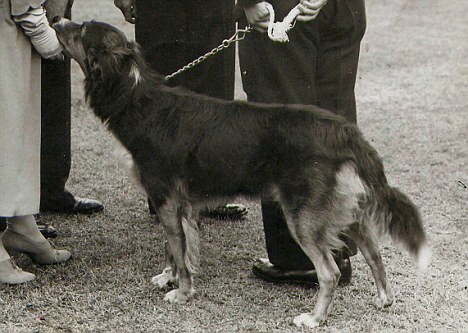 Treo will become the 63rd animal to receive the Dickin Medal for wartime service. Since its introduction by the PDSA’s founder, Maria Dickin, in 1943, it has been given to 26 other dogs, 32 Second World War messenger pigeons, three horses and one cat. 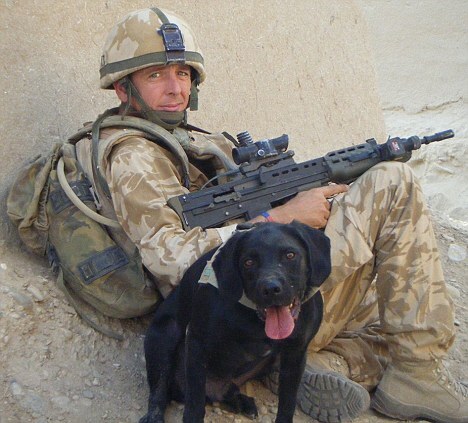 In February 2007, two Dickin Medals were awarded – one posthumously to Lucky on behalf of all the anti-terrorist dogs on duty during the Malaya campaign in the Fifties; and another to Sadie, an Army explosives search dog, for bravery in Afghanistan in 2005 alongside her handler, Lance Corporal Karen Yardley.